Downstairs at the Eldridge Street Synagogue, 10 men in yarmulkes daven. Upstairs in the women’s section, I sit by myself, thinking about my immigrant grandparents and their arrival on the Lower East Side of New York City. 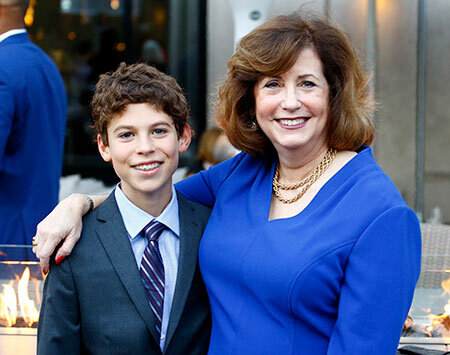 My 13-year-old Jewish-Episcopalian great-nephew is among the daveners. He is the reluctant final member of the minyan at this Shabbat service. Ryan and I had just finished an early morning brunch of dim sum in Chinatown when we walked over to the Eldridge Street Synagogue. Today, the synagogue is considered one of Manhattan’s most beautiful houses of worship. More important to us, the old shul, which opened in 1887, was probably the spiritual home for Ryan’s great-great-grandparents—my grandparents—who came to America from Russia, Romania and Hungary at the turn of the 20th century. Most days of the week, the synagogue is a museum. I hadn’t realized religious services were still conducted there and hadn’t considered that it was Shabbat. The building was not open for tours. As we stood outside, admiring the façade with its Moorish arches and Romanesque stonework, a man approached and asked if we would join the service. I respectfully declined, offering a host of excuses. Though we are Jews, we aren’t Orthodox. We weren’t dressed properly. Privately, I thought of the adventures we had planned: a stop for ice cream, a visit to the Cloisters at the other end of Manhattan. Going to a lengthy religious service wasn’t on our to-do list. Ryan and I thanked him and walked away. Half a block away, the man caught up with us. “Please, won’t you join us?” he asked again, explaining that they were short one congregant and that without Ryan, they wouldn’t have the necessary 10 men needed to conduct the service. I turned to Ryan and said it was up to him. He said yes. The service began as soon as we entered. While the men were all very focused on their prayers, they took time to attend to Ryan, pointing out where they were in the prayer book. Ryan followed along, reading in English. He helped cover the Torah scrolls and in other small but meaningful ways participated in the service. He was thoroughly engrossed. Upstairs, to my great surprise, I was engrossed, too, despite my lack of Hebrew and my discomfort with the Orthodox practices of not counting women in minyans and separating them from men during services. These customs have always been hard to swallow for me, a Reform-to-the-max Jew. But I enjoyed the enforced quietude. I didn’t look at my watch or cellphone. There was no English sermon to distract me. Just the Hebrew chanting, prayers and songs of the worshipers below. I thought of the rapid pace of assimilation that had taken my grandparents from Eastern Europe to the Eldridge Street Synagogue, then to the Upper East Side of Manhattan and, in the case of my grandmother in her later years, to Las Vegas with my family. No wonder Grandma liked to talk about the past. It was a dizzying journey from her kosher kitchen and traditions to shrimp and lobster dinners in casinos, from weekly prayers in Hebrew to burial by a rabbi she had never met. I wondered what my grandparents would have thought of my secular lifestyle and my interfaith marriage. I know they would have loved my gentle, smart husband; been glad we were married by a rabbi and that my son had a bar mitzvah. As I thought about all this, I admired the jewel box that is this synagogue: the brilliantly hued turquoise-and-gold Star of David stained-glass window, the magnificent 50-foot ceilings, the polished wood of the pews. While that window is a new addition, this glorious temple must have been an astonishing contrast for the immigrants who had worshiped amid prejudice and adversity in the Old Country and toiled amid economic hardship in an unknown new one. Downstairs, my great-nephew had conquered his own fears of the unknown. There among strangers, he stood—not knowing a word of Hebrew, not knowing when to stand or sit. Yet he, too, found his place and strength in the traditions of our ancestors. He read the ancient texts and later told me what he thought about the passages regarding Moses. There among strangers, Ryan was a hero. He saved the Shabbat service for nine observant Jewish men, some old, some young. Thanks to him, the temple of our ancestors carried on its traditions, rituals and obligations for another day. Karen Galatz, an award-winning journalist, writes the weekly humor blog Muddling Through Middle Age and The Matzo Chronicles for J. The Jewish News of Northern California.